This quick review was provided by Gretchen, whose son is allergic to peanut, cashew, egg, and dairy. A chef was at our table within 3 minutes of being seated. He walked us through the buffet and told us what they would prepare for our DS in the kitchen free of his allergies and cross-contamination. It took about 15 minutes, but a HUGE plate of food was prepared and delivered to my 3yo son. 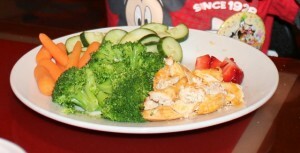 Baked chicken, broccoli, carrots, cucumber, and fresh strawberries. At the end of our dinner, a 1st visit cupcake was brought to my DS that was all allergy-free complete with icing. My DS was in heaven! “For me? I can eat it?” We plan to eat here at least once on every return visit! Plus, the character interactions are some of the best around! If you would like to review Chef Mickeys or any Disney restaurant, submit a food allergy dining Quick Review. I'm so glad you had such a good experience. We were there early November/late December of 2011 and Chef Mickey's was our only bad experience. The chef was very rude to us and not happy at all about being asked to make something in the back for my son with severe peanut and tree nut allergies. I spoke to the manager afterward, who did not even offer an apology. I was floored. We had dinner there in 2009 on our first trip, it was horrible! There was hardly anything my kids could eat out on the buffet and we were not offered anything from the back. We had breakfast there in September 2012 and it was so much better! There were foods on the buffet they could eat and they brought out Mickey waffles! did you tell them about the allergies ahead of time (when booking or a few days ahead)? we have reservations and i’m wondering if we should call ahead? 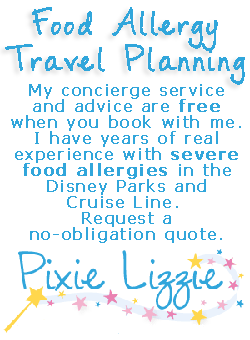 Be sure to tell Disney when you make your reservations. If you did not do so when you made the reservations, call them back and add the food allergy information to each reservation. 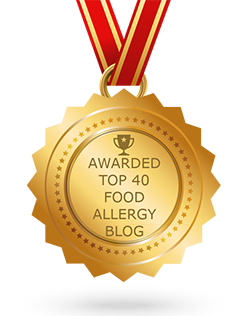 Also, when you arrive at each restaurant, be sure the host or hostess sees the food allergy and informs your server, who should then ask the chef to stop by your table.